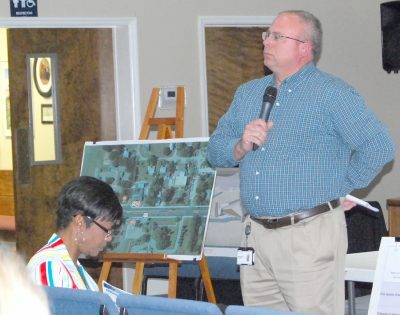 Keith Slater, district traffic operations engineer for Florida Department of Transportation, listens to comments from Parrish residents at a meeting about the proposed U.S. 301/C.R. 675 intersection project. Around 115 residents of Parrish met Jan. 24 at the Parrish United Methodist Church to provide input on a Neighborhood Action Plan that was being developed. The Village of Parrish, settled in the mid-1800s, was no more than a few buildings at a crossroad near what is now U.S. 301 North and Erie Road and was known as Oak Hill back then. As more settlers moved to the area, the community grew in the late 1800s with more businesses to service the surrounding ranchers and farmers. By the time the railroad tracks and depot were built in the early 1900s, the community was renamed Parrish after one of its prominent residents, Crawford P. Parrish. The village remained pretty much the same until about 15 to 20 years ago when new housing developments began to be built on former ranches and farms that surrounded it. Several thousands of new homes have been constructed and thousands more are planned in the area surrounding the village. With all the growth, the area will have a new elementary school and high school opening in the fall, and a new campus of State College of Florida is planned. The commission hired Mellgren Planning Group, a Fort Lauderdale-based urban planning and consulting firm, to do studies, conduct interviews, reach out to the community for input, and develop the action plan. An action plan offers communities a document that provides the residents a guide to achieve their visions for their neighborhood. Althea Jefferson, city planner and senior associate with Mellgren Planning Group, guided the residents through several planning exercises and discussions at the community meeting last week, recording their input to help her write the action plan. “I think the community was very intent on providing us with direction in terms of what type of retail (they would want in the village),” Jefferson said after the meeting. Jefferson said one of the first tasks she did in preparing for the meeting was gather socio-economic demographical data for the area, such as housing, education levels and population growth rates. “We also looked at other studies the county has done on the area,” she said, as well as what developments and capital improvements were planned or approved. 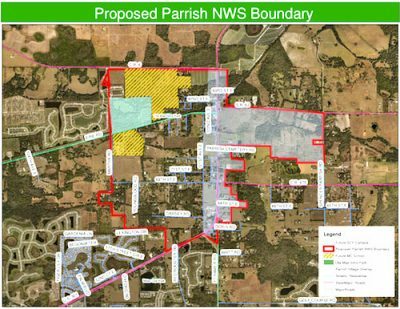 Mellgren Planning Group was contracted to study a specific area roughly bounded with Erie Road on the north, the west side of U.S. 301 on the west, Martha Road on the east, and Lexington Drive and U.S. 301 on the south. 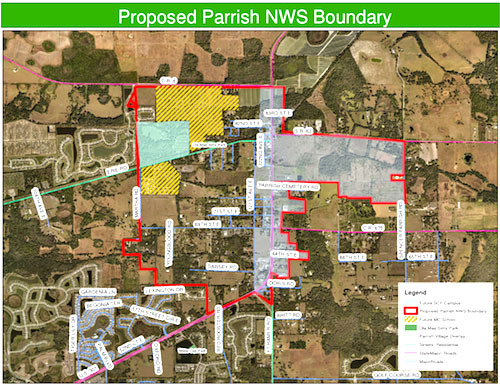 This area included most of the older residential homes of the village, the main retail strip along U.S. 301, the new schools and a proposed county park. An illustration provided to attendees of a meeting Jan. 24 at the United Methodist Church shows the Florida Department of Transportation proposed U.S. 301/C.R. 675 intersection project. At the meeting, Jefferson presented a study on where and how far residents have to drive to purchase goods. Called a leakage report, the study found Parrish residents driving 10 to 15 miles away from the village to buy furniture, home furnishings, electronics, appliances, building materials, garden equipment and supplies and gasoline. She said planned improvements such as the Central Park project and the new YMCA will complement specific types of new business, such as a sports equipment store or a smoothie shop. Participants at the meeting were encouraged to add to a wish list of businesses they would like to see in the village. One of the exercises Jefferson had the meeting attendees perform was to pick their priority project or item of interest from a list she compiled from her studies and interviews with several residents. The exercise, which is popular at many vision-planning sessions, has the participants use five colored sticky dots to place near their most important project listed on large poster boards. The residents could put as many of their five dots next to the item they thought was the most important, such as more retail stores or improved streets and infrastructure. One of the topics Jefferson had the participants discuss was street improvement. Many of the streets in the village are no more than hard-topped lanes, some barely wide enough for two vehicles to pass side-by-side. The Florida Department of Transportation and Manatee County are promoting a program called Complete Streets, which develop a mixed-user corridor for cyclists, pedestrians, transit riders, motorists, and delivery vehicles. 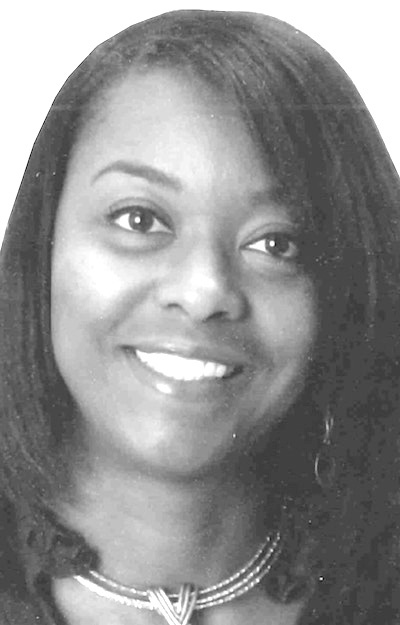 Jefferson will compile the input from the residents at the meeting, along with her research into the Neighborhood Action Plan in the next 60 to 75 days. She will present the plan to the Parrish residents and county commission. The Parrish Neighborhood Action Plan will include the area within the red line on the map. For Gretchen Fowler, president of the Parrish Civic Association, the meeting was a great success. “The reason the commissioners picked Parrish (as one of the two communities to have an action plan developed) was because the Parrish Civic Association is an active group,” Fowler said. “The meeting was very well organized,” she said. “(Jefferson) got everyone interacting, and she got a lot of feedback. Parrish resident and local historian Iris McClain wanted the Neighborhood Action Plan to remember the history of Parrish. After Jefferson finished with her presentation, a Florida Department of Transportation representative who Manatee County Commissioner Priscilla Whisenant Trace invited talked about the proposed changes to the intersection at U.S. 301 and C.R. 675, also known as Rutland Road, where there have been several serious accidents over the years. Keith Slater, district traffic operations engineer for the state transportation department, commonly referred to as FDOT, provided handouts with facts and figures, and an illustration of the proposed change. According to the handbill, the project will construct a median along U.S. 301 from C.R. 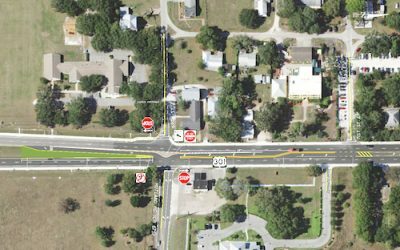 675 north to 71st Street East, provide for a new left turn lane onto 71st Street East from U.S. 301, as well as an improved left turn lane from U.S. 301 onto C.R. 675. There also will be a new acceleration/merge lane for vehicles turning left off of C.R. 675 onto U.S. 301 heading south. The median will prevent traffic heading west on C.R. 675 to cross U.S. 301 to access 69th Street East, and vice versa. This was a problem for many people attending the meeting because it cuts off easy access to the United Methodist Church on 69th Street East. Most of the people who spoke at the meeting wanted a traffic light, but Slater said traffic count on the two roads did not meet the standards of the Manual of Uniform Traffic Control Devices to warrant a traffic light. Parrish resident and activist Tami Vaughan, expressing the sentiments of many at the meeting, said the FDOT solution would not solve the problem of multiple accidents at the intersection. For more information on the Parrish Civic Association visit its website at www.parrishcivicassociation.com. Learn more about the Mellgren Planning Group at www.floridaplanning.net.